We quit with our highly appriciated Art Agenda. It is to much work for us, besides that there is a hip new agenda you can consult. They claim they own the city. 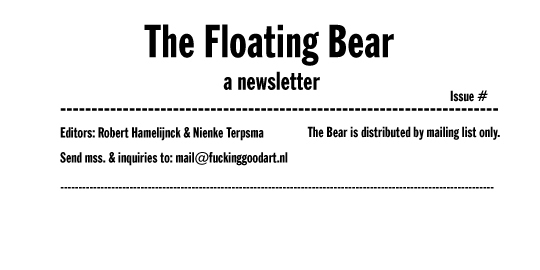 As we said in the beginning we made the Art Map and agenda to re-connect with the art scene of Rotterdam. The first Art Map with 77 aesthetic zones we published and printed in May 2009, followed a year later by Art Map 2.0 March 2010. This time we made clear categories: project spaces, institutes, galleries, independent magazines and publishers, web based projects, collective studio buildings with a public program. And we listed 73 aesthetic zones in Rotterdam. Not bad! But is it also good? In our Good Blog we will try to address this issue starting from January 2011. Merry X-mas and all the best for 2011. Stay tuned. See you next year!